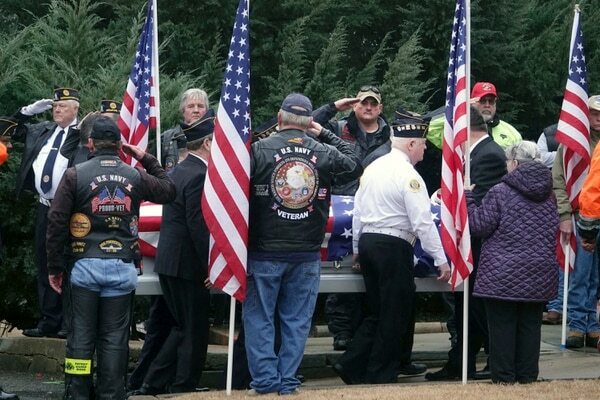 MEMPHIS, Tenn. — When the flags were removed from the caskets and folded with military precision, there were no family members there to receive them. So, the banners were passed, hand-to-hand, through the crowd. Some mourners wept as they clutched the flags briefly. Others kissed them. But the three veterans laid to rest on a rainy Memphis morning were strangers to most of those who gathered to honor their memory. 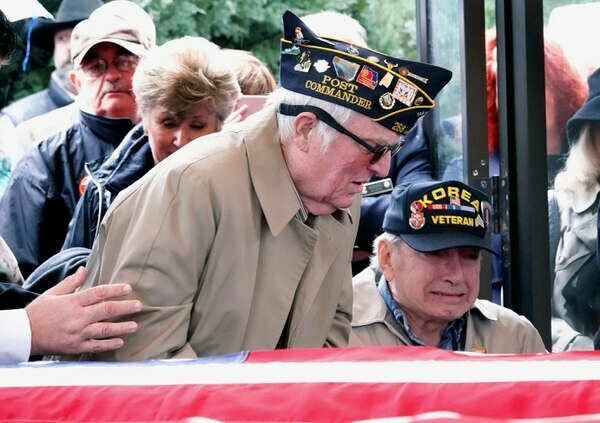 The service was part of a national effort by funeral homes, medical examiners, state and federal veterans' affairs departments, and local veterans' groups to pay final respects to members of the military whose bodies were not claimed by any relatives. 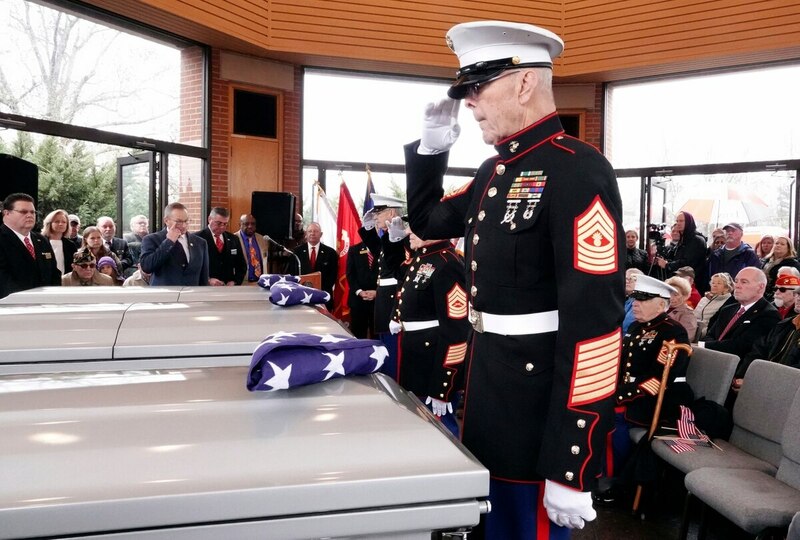 Since 2000, Dignity Memorial and other funeral homes in more than 30 cities have organized about 3,000 funerals for soldiers, sailors and Marines who died alone, but still deserved a dignified funeral and burial, said Jeff Berry, Dignity's general manager in Knoxville. But none of them had family members present. Amelia Callicott did show up. She wept during the service, thinking of her late father and husband, who both served in the military. Callicott said she learned about the service through friends and Facebook. She felt a duty to honor the men. "It touched my heart when no one came to claim these gentlemen, these soldiers, because they fought for our freedom," said Callicott, 69. "Any serviceman, they're just like family to me, and I just can't see laying them to rest without going and seeing their final moments, to say goodbye." Organizing the funerals, which are fairly commonplace in Tennessee, requires a lot of teamwork. Berry said the process usually begins with county medical examiners or local coroners, who contact state or national veterans' cemeteries with names of people whose bodies have gone unclaimed. They typically were either homeless or had no surviving relatives to claim them. And some have had surviving family members who did not want to claim them. The cemeteries determine whether the service members were honorably discharged. If they were, medical examiners or the cemeteries then contact Dignity, which is owned by Service Corporation International, or one of its partner funeral homes. A funeral director then sets up the memorial service, and the funeral home covers the cost, Berry said. Cemetery directors can file claims with the U.S. Department of Veterans Affairs for grave markers or placards for columbariums, according to the Tennessee Department of Veterans' Services. The VA also gives money to individuals or entities that provide burials, caskets and transportation to cemeteries for unclaimed deceased vets. Memorial services are publicized through news outlets, veterans' groups like the American Legion, or social media. Honor Guard and other active military members attend, but it's the strangers who come out of respect for the military and the dead who bring dignity to the occasion. A service for unclaimed veterans is planned in the coming weeks at East Tennessee State Veterans Cemetery in Knoxville, Berry said. "Most of the time, it's folks that had no knowledge of the person in life," Berry said. "One thing I've learned in working with the veterans is that they are a tight knit group. They really support each other. It's like a band of brothers or sisters." During the Memphis ceremony, funeral director Gary Taylor thanked those who showed up. Then, he spoke directly to the caskets.